If you love stories of old Hollywood, the synopsis of A Touch of Stardust teases behind the scenes drama on the Gone With the Wind set. Through the eyes of aspiring screenwriter / personal assistant Julie Crawford, you do enjoy a front seat to clashes between David Selznick and directors, actors, and studio heads, but GWTW accounts for only a fraction of Stardust. The true star of the show is Carole Lombard who, while not even in the cast, nonetheless plays a crucial role as Clark Gable's lady. Stardust doesn't focus on just one conflict, and anybody up on their GWTW history knows the making of the film alone could fill many books. Author Kate Alcott balances the tensions behind filming the American Civil War with the looming war in Europe, which filmmakers are discouraged from touching. As Carole's assistant, Julie deals with scandalous Gable/Lombard publicity while diving headfirst into a relationship with an older, Jewish man determined to do his part for the cause. Each of the stories (the movie, the relationships, the struggle to work in film) overlap and fit like a secure braid. 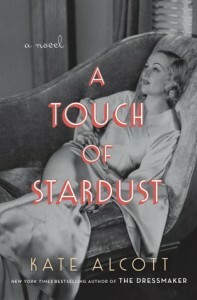 I enjoyed Stardust, especially when Carole Lombard had control. If you're a fan, you'll enjoy the story. If you've not heard of her, Stardust may make you a fan.